While this series of articles is in construction some tiny versions of the eventual photos will be seen in the relevant places, even before we are authorized to publish them. Unusual practice, but as we are in the process of contacting every copyright owner, it helps in explaining what we are trying to achieve (someone already asked if it was an encyclopedia of eggplants). Should any one feel offended by this process we apologize and will remove any picture that we are specifically told to remove PROMPTLY. We hope to raise the interest level of all people contacted by having these tiny gifs there as appetizers. We certainly are not in the business of exploiting or taking advantage of anyone. Education is our game and not only does it not pay but it costs us far too much. We in turn do not feel exploited however, for we find it too hard to stop our compulsive urge to share knowledge. Moreover we learn as much as our readers in the process, so perhaps we are just selfish and trying to satisfy a deep need. Hum! a psych. thesis in perspective. Overall Disclaimer The information in these articles is offered in good faith, without warranty. Although the compiling has been done with extreme care it is not possible to guarantee the accuracy of all the data. It is meant to be used with a fair degree of common sense and logic. Neither the author Michel H. Porcher, nor any publisher of this article will have any liability whatsoever to any person or organisation in respect to any alleged loss, damage or liability incurred from the use of the information presented. Opinions expressed on these pages are the author's own and do not represent the views of the The University of Melbourne, the I.S.T.A, USDA - ARS - GRIN or their respective staff, neither is it meant to represent or support any view expressed elsewhere by all the authors quoted, the companies and organizations referred to. This is just an appetizer, keep clicking. Links to illustrated pages 2, 3, 4. This series of articles entitled "Know your …" is born out of my frustrations of the last 2 decades during my work on the MMPND, when I observed the demarcation between the world of taxonomy on one hand and what I call the trade on the other, that is the seed industry, the nursery industry, and all their associated professionals as well as gardeners, farmers, cooks and chefs. The two groups tend to ignore each other as if they belonged to two different worlds. It has been slowly changing in the last 4 or 5 years and hopefully, starting with these articles on eggplants I will stimulate a few more people towards more cooperation. I must have been very inspired when I got involved with flickr because I can see the tremendous potential of all these photographers craving for recognition. I know also that academics in general, taxonomists in particular are always short of nice photos to illustrate their work. Here is a match if ever I saw one. So I am showing the way. I am also attempting to involve seed companies a second time, this time with a lot of "baggage". The first time, back in the mid eighties when I really began the MMPND project, I was not very successful because I could not explain clearly enough what I wanted to achieve and I was looked upon as a threat (as the late Georges Brassens would have put it "un empêcheur de tourner en rond") more than a well intentioned fool… well! I was told far too often "Who in his right mind would attempt such a project". Well folks this is it, this is the beginning of the crowning of the project, these articles reflect what I wanted to achieve. It appears that I was alone in understanding the amount of work that had to be invested and I was pretty much the only person willing and able to spend the time doing the task. I probably won't live long enough to cover all the main crops but I'll give it a darn good go starting with our beloved eggplants. Since its importation many decades ago (18th century?) the eggplant, as we know it in the west has mostly been a food plant producing the vital ingredient to many traditional and regional dishes such as the Greek Moussaka. In the garden it is a plant with simply huge dark boring uninspiring fruits. In its original imported state (from India and other exotic places) it had a fruit that was truly egg-shaped, hence its English name, translated in French by "La plante aux oeufs" in the great catalogues of the past. There is a little disagreement on the colour of it but whether it was white, black or anything in between, like many of its cousins the tomato or the nightshades, it was a curiosity, an ornament in the garden with suspected poisonous overtones in those times. In recent decades, following worldwide searches in the centres of diversity a tremendous number of new varieties and species have been uncovered and exploited by the seed industry. Unfortunately the horticultural industry the market gardeners and the providers of this vegetable have not taken advantage of this diversity pretexting a lack of interest by their customers. Although this is true to a certain extent, it is also a fact that if a corporation wishes to impose a new taste on the unsuspecting public a few good ads strategically placed can work wonders. It has been left to gardeners however to do the promotion of exciting varieties of eggplants. These articles are simply part of this worldwide movement, the push for diversity in our food plants. How does that fit into the loss of bio-diversity debate? In order to answer this question we first have to look at the science of plant classification and its shortcomings. Please note that I have taken the habit of writing the significant botanical Latin words, which by convention should be in italic, in bold. This practice began with the original online publishing of the MMPND for screen effect. Today as we update our files we try to combine both. # USDA ARS GRIN < http://www.ars-grin.gov/cgi-bin/npgs/html/taxon.pl?101312 >. # International Society for Horticultural Science (ISHS) Acta Horticulturae 647.
International Code of Nomenclature for Cultivated Plants - Code International pour la Nomenclature des Plantes Cultivées. I can hear "at a price of € 55 it is no wonder that non-professionals do not bother buying it. These publications of International value should be available on line via a registration form but free of charge. Then the content might be taken into consideration more often in daily life" Well! It is < http://www.actahort.org/books/647/ >. The above names albeit botanically correct do not match the standards (see ISHS) which are meant to be used for cultivated plants. The denomination "var. for variety" should only be used for wild plants. It is a level of classification used in taxonomy and should not be confused with a variety in common language to designate a cultivated variety or a cultivar in taxonomy. A cultivar is indicated by single quotation marks (ex: 'Gretel'). In turn a cultivar name which as a formal status is different from a commonly given name such as "Thai round green eggplant". These names often begin their life as literal translations or transliterations, especially when dealing with scripted names, and are taken advantage of for commercial reasons. The groups as in (Group name) are collections of cultivars. In botanical context these are almost the same as the "convar." label. The above names including "var." should be considered as synonyms (from an older system) of the names included in modern nomenclature such as those using the "Group name" appellation. This group will include all cultivars with cylindrical fruits. We have a varietal name from the old system - a synonym of the name from the new system. The universal name used in all catalogues for eggplants is Solanum melongena L. Flora Europea gives 2 synonyms for this: Solanum ovigerum Dunal & Solanum esculentum Dunal. Strictly speaking the later is a "basionym" the other a synonym of a different group Solanum melongena L. (Ovigerum Group) . In the literature we are often told that Solanum integrifolium is a synonym of Solanum aethiopicum. It is not strictly correct. Solanum integrifolium Poiret is a synonym of Solanum aethiopicum L. (Aculeatum Group) but neither a synonym of the Kumba Group nor the Gilo Group etc. Similarly Solanum dasyphyllum Thonn. ex Schum. is a synonym of Solanum macrocarpon Poir. (Semi wild Group) but neither a synonym of the Mokono Group nor the Nabingo Group etc. Finally a complex example: Solanum indicum L.
Solanum ferox Burm. f. (tolerated) = Solanum ferox L. ? Solanum indicum L. (dubious) = (Not accepted) "nom. rej., a rejected name (nomen utique rejiciendum) under Vienna ICBN Art. 56 & App. V that is unavailable for use." (USDA-ARS GRIN). All the names on the left, apart from the last, are tolerated as synonyms by taxonomists. So following a considerable researching time one finds all these synonyms. No wonder that the name Solanum indicum L. has been declared "unusable" or words to that effect. The point is that unless one adds the authority names at the end of either Solanum ferox or Solanum indicum one is never sure which species is taken into consideration for whatever work, mine happens to be translation. Many dictionaries will associate common names to any of those botanical names without precisely pinpointing what it is. It is likely that the lexicographers of the past would not have been aware of the taxonomic intricacies so they cannot really be blamed for the numerous mistakes and omissions found in the dictionaries. Today however computers and the internet allow us to be far more aware and accurate … and less blameless. Generally speaking in terms of bio-diversity the species is the unit that is counted when assessing the losses. A specific name (species) is made up of two words (a binomial) a generic name (genus) and a specific epithet. Normally it should also have the abbreviated version of an authoritative expert's name - a taxonomist (a botanist specialised in plant classification). Already there are problems with this. 1. Because the authority name is almost always omitted in horticultural literature it leads to grave mistakes of identification. As demonstrated above Solanum indicum is a perfect example of how this process can get totally out of control. 2. When it comes to food plant diversity at the specific level we only consider the "tip of the iceberg" because if a species is lost all the subspecies, the varieties, the forms, the hundreds of cultivars (cultivated varieties) and their regional selections (as well as other types of selections - usually simply market driven) are lost. In other words one loss can in reality equal thousands. This would not be an overstatement in many cases. This may not be called "plant bio-diversity" but it is a loss of diversity nevertheless. What is lost is the patient work of selection by generations of gardeners and farmers from every corner of the globe. The "new world order" can be both an accelerator of the problem via the concentration of the heritage in a few "corporations hands" (facilitated by governments) or part of the solution via the inter-connected networks of seed savers, the slow food movement, the revival of regional cooking and related terroirs, etc. This however is increasingly under threat due to various laws related to "official lists", quarantine restrictions, patenting, and business laws. Let us now consider the state of eggplants - Almost in great shape in fact, compared to some other food plants. See Pt1 - African Eggplants for African lexique. See Pt2 - Asian Eggplants for Asian lexiques. ARABIC : باذنجان Bādhimjān, الباذنجان Badinjan (al baðinjān). BENGALI : বেগুন Begun, বার্তাকু Baingan. BULGARIAN : Патладжан Patladzsan . CHINESE : 茄 Qie, 茄子 Qie zi, Ai gua / ngai gwa (Cantonese name). CROATIAN : Патлиџан Patlidžan . CZECH : Lilek, Lilek baklažán, Lilek vejcoplodý. 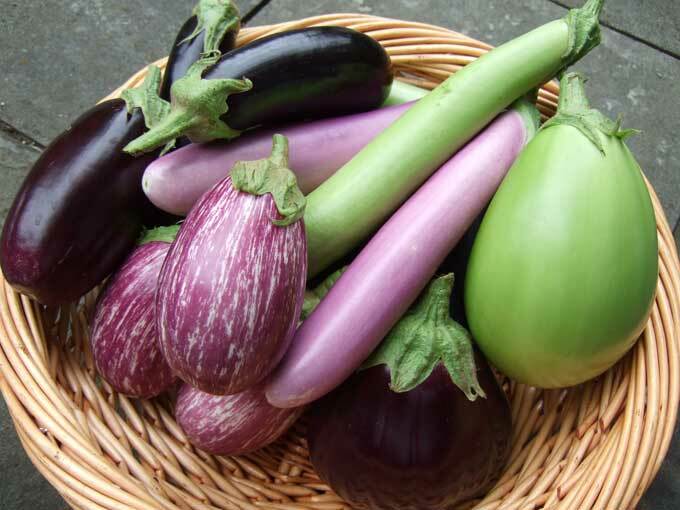 DUTCH : Aubergine, Eierplant, Eiervrucht, Melanzaanappel. ENGLISH : Aubergine (UK. ), Eggplant (USA), Brinjal (India), Large-fruited eggplant, Melongen (Caribbean Trinidad). FINNISH : Aubergiini, Munahedelmä, Munakoiso. FRENCH : Albergínia (Catalan), Aubergine, Bringelle, Mélongène. GUJARATI : રીંગણ Ringan, Ringna, વેંગણ Vengan. HEBREW : חציל Hatzil, חָצִיל Hatzil. HINDI : औबरजाइन्स Aubarajā'insa, बैंगन Baigan, Baijani, बैंगन Baingan. HUNGARIAN : Padlizsán , Padlizsános, Tojàsgyümölcs. ITALIAN : Maranziana, Melanzana, Mulignana, Petonciano, Petrociana. JAPANESE : ダ イマルナス Daimaru nasu, 大丸なす Daimaru nasu, 大丸茄子 Daimaru nasu, エッ グプラント Eggupuranto, 茄子 Nasu, なす Nasu, ナス Nasu. KHMER : Trâb vèèng, Trâb put lonhoong. LAOTIAN : Khüa ham maaz, Khüa hlèèz, Khüa poom. MALAY : Terong, Terung (Indonesia), Encung (Indonesia), Tiung (Sumatra). MALAYALAM : Valutananna, Vazhudhanaikkai, വഴുതന Vazhuthana, Vazhuthananga. PERSIAN : بادنجان Bâdenjân, بادنجان Bâdinjân. POLISH : Bakłazan, Gruszka miłosna, Oberżyna, Oberżynowy. PUNJABI : ਵੈੰਗਣ , ਬੈਂਗਨ Baingana. ROMANIAN : Patlagea vanata, Pătlăgea vânătă, Pătlăgele vinete , Vanata, Vânătă, Vinete. RUSSIAN : Баклажан Baklazhan (Baklažan). SANSKRIT : Bhantaki , Nattingan, वातिगगम Vaatigagama (vātiga-gama), वृन्ताकम् ,Vatinganah, Varttaka. SERBIAN : Плави патлиџан Plavi patlidžan, Патлиџан Patlidžan. SLOVENIAN : Jajčevec, Patlidžan jajcevec. SPANISH : Berenjena, Albergínia (Catalan). SWEDISH : Äggplanta, Äggört, Aubergine. TAMIL : Kathiri , Kathirikai, கத்திரி Kattiri, கத்தரி . TELUGU : వంగ Vanga, వంకాయ Vankāya, బ్రింజాల్ , ఎగ్గ్ ప్లాంట్ , ఆబర్జీన్ , వార్తాకము. THAI : มะเขือ Makhua, มะเขือยาว Ma khuea yao (Ma khuea yaao, Makhua yao, Makhua yow) , Makhua chan, มะเขือขาว Ma khuea khao (Má kĕua kăao, Makhua khao, Ma khua kow, Ma kuah kow). TURKISH : پاتلیجان (patlıcan), Patlıcan. VIETNAMESE : Cà tim, Cà bat, Cà tin, Quả cà. I wish to acknowledge the kind cooperation of many colleagues mentioned throughout this article and mostly all my flickr contacts who have provided useful comments and many of those beautiful photos. Thanks to all. ***** This is a sign of a great reference. AllPenang.com, 2007, Multilingual List of Vegetables available in the Penang Wet Market. < http://malaysian-cuisine.com/touristinfo/wet_market-vegetables.htm >. Bukenya, Z. R. and J. B. Hall. 1987. Six cultivars of Solanum macrocarpon (Solanaceae) in Ghana. Euphytica 17(1): 91-5. College of Agriculture and Life Sciences - Cornell University. Interesting evaluations of most eggplants cultivars on the market by subscribers. < http://vegvariety.cce.cornell.edu/mainSearch/showAll.php?ID=23&sortBy=overallrating&order=DESC&searchIn=1 >. DNP, 2005, Solanum trilobatum. National Park, Wildlife and Plant Conservation Department. Thailand. < http://www.dnp.go.th/MFCD20/heab-5.htm >. Elizabeth Byanjeru Rubaihayo, Conservation and use of traditional vegetables in Uganda < http://www.bioversityinternational.org/publications/Web_version/500/ch15.htm >. Ethiopian Plant Names < http://www.ethiopic.com/aplants.htm >. Flora Europaea: Database of European Plants (ESFEDS). Guillet Dominique, 2007, Semences de Kokopelli, 7th Edition. Edition La Voix des Semences. pp. 452 - 463.
International ECPGR Eggplant Database. Botanical and Experimental Garden, Radboud University Nijmegen, The Netherlands. EGGNET (EGGplant genetic resources NETwork), a project funded by the European Union. The project is coordinated by Ms. Marie-Christine Daunay, Unité de génétique & amélioration des fruits et légumes, INRA, Montfavet, France. < http://www.bgard.science.ru.nl/eggnetdb2/ >. International Society for Horticultural Science (ISHS) Acta Horticulturae 647.
International Code of Nomenclature for Cultivated Plants - Code International pour la Nomenclature des Plantes Cultivées. < http://www.actahort.org/books/647/ >. Mansfeld's World Database of Agricultural and Horticultural Crops. MARTIN F. W. & RHODES A. M. 1978, SUBSPECIFIC GROUPING OF CULTIVARS EGGPLANT. Euphytica 28 (1979) 367 383. Mayaguez Institute of Tropical Agriculture, Florida Area, Southern Region. Science and Education Administration, U.S. Department of Agriculture, Mayaguez, Puerto Rico 00708 & Department of Horticulture, University of Illinois, Urbana, Illinois 61801, USA. Medicinal Plants of Myanmar. < http://www.tuninst.net/MyanMedPlants/TIL/famS/Solanaceae.htm#Solanum-spp >. M.M.P.N.D. For all nomenclatural details we refer you to our page on Eggplants. Natural History Museum. Solanaceae Source - A global taxonomic resource for the nightshade family. < http://www.nhm.ac.uk/research-curation/research/projects/solanaceaesource/taxonomy/list.jsp >. PROTABASE: Plant Resources of Tropical Africa's (PROTA's) online resource. < http://database.prota.org/ >. Bukenya-Ziraba, R., 2004. Solanum anguivi Lam. [Internet] Record from Protabase. Grubben, G.J.H. & Denton, O.A. (Editors). PROTA (Plant Resources of Tropical Africa / Ressources végétales de l’Afrique tropicale), Wageningen, Netherlands. < http://database.prota.org/search.htm>. Accessed 18 April 2009. Lester, R.N. & Seck, A., 2004. Solanum aethiopicum L. [Internet] Record from Protabase. Grubben, G.J.H. & Denton, O.A. (Editors). PROTA (Plant Resources of Tropical Africa / Ressources végétales de l’Afrique tropicale), Wageningen, Netherlands. < http://database.prota.org/search.htm>. Accessed 18 April 2009. Bukenya-Ziraba, R. & Bonsu, K.O., 2004. Solanum macrocarpon L. [Internet] Record from Protabase. Grubben, G.J.H. & Denton, O.A. (Editors). PROTA (Plant Resources of Tropical Africa / Ressources végétales de l’Afrique tropicale), Wageningen, Netherlands. < http://database.prota.org/search.htm>. Accessed 18 April 2009. Schippers, R.R., 2004. Solanum torvum Sw. [Internet] Record from Protabase. Grubben, G.J.H. & Denton, O.A. (Editors). PROTA (Plant Resources of Tropical Africa / Ressources végétales de l’Afrique tropicale), Wageningen, Netherlands. < http://database.prota.org/search.htm>. Accessed 18 April 2009. Scientific-Consulting Center (SCC ), 2001-2009, Agriculture Consulting Ltd. (Official Ukrainian and Moldavian Distributor of Seminis). Russian & English versions of every page. Solanaceae: A global taxonomic resource for the nightshade family. USDA ARS GRIN < http://www.ars-grin.gov/cgi-bin/npgs/html/taxon.pl?101312 >. See also this section on all related pages. Annadana, "Brinjal: Seed Production" . Tips on saving seeds from an Indian branch of Kokopelli. FOTOSEARCH - Stock Photography and Stock Footage. EEC. The 2008 official EEC European seed list for eggplants. This is the hated list at the center of the landmark court case Graines Baumaux vs Kokopelli. I have just learnt that Sweden is actually exempted from adhering to the list because their extremely cold conditions require locally adapted cultivars. Thanks Søren for this piece of information. Unfortunately this list does not tell us which cultivar is open pollinated or hybrid but it is still worth looking at. Seeds of India. A useful glossary of food ingredients in 7 popular languages from India. Svalbard Global Seed Vault - Global Crop Diversity Trust - NordGen . You may have heard of it already, if not it is worth exploring the site itself. It is also worth browsing the many positive and negative comments on this project. There are interesting questions posed such as: where is the financial backing coming from? Who exactly has access to the germplasm? Can germplasm stored this way in such "gianormous" quantities be renewed often enough to ensure viability of the seeds? How much information is revealed via the interface with the general public? etc. College of Agriculture & Life Sciences , Cornell University , Cornell Cooperative Extension , Cornell Garden-Based Learning Institute. University of California Cooperative Extension, Santa Clara County Master Gardener Program, McClellan Ranch Project. Co-Leaders Magie Klughertz and Tom Jow. Fred Schulenburg provided some excellent photos that may or may not be viewable depending on your browser. We will incorporate them into our files soon with permission. Eggplant trial 2004. Photos: < http://www.mastergardeners.org/projects/mcclellan/2004/eggplant_photos.html >. Note1: I understand that using the same Botanical-Latin word in both the group name and its matching botanical synonym is discouraged by taxonomists. My view, based on considerable experience in nomenclature, is that the alternative is invariably to use English word(s) instead for the group name, and I do not like it for the following reasons. One: English may be the most international language of all but it is not the preferred language of all people. It is presently the easiest to use in the electronic medium but with improving technology this is changing very fast indeed. Two: assuming that English is for ever the adopted standard, with none of Nostradamus forecasting powers, I can safely predict that either most cultivar names will be replaced with numbers, or the number of cultivar names will be multiplied by an inestimable enormous factor. This is because, say for argument sake, that one wanted to call a Japanese or an Indian cultivar by its English equivalent. Which standard of translation / transcription / transliteration is going to be used? any number out of 30 possibilities. A bonanza for the merchants who like to disguise a known entity under various alias. What a travesti of real bio-diversity that would be. Computer are fantastic machines but I doubt that they could keep a record of all synonymy, leaving aside all the accession numbers from various databases around the world. Three: Botanical-Latin words have been and are recognized more and more by the general public in any country in any language - this is not by choice but by economic necessity. My view is why change those words again for something that will be as obscure to some people as Botanical-Latin? There may be millions of English readers but there are billions that cannot read English. Which English anyway? American, British, Australian, Indian, Australian? The use of group names is meant to be a simplification of the complicated "subvar." and "convar." of the past so let's keep it as simple and stable as possible.